We have developed strategic partnerships with our colleagues! As professional investigators you provide a most valuable service. You are often the first contact for attorneys and persons with personal legal concerns. 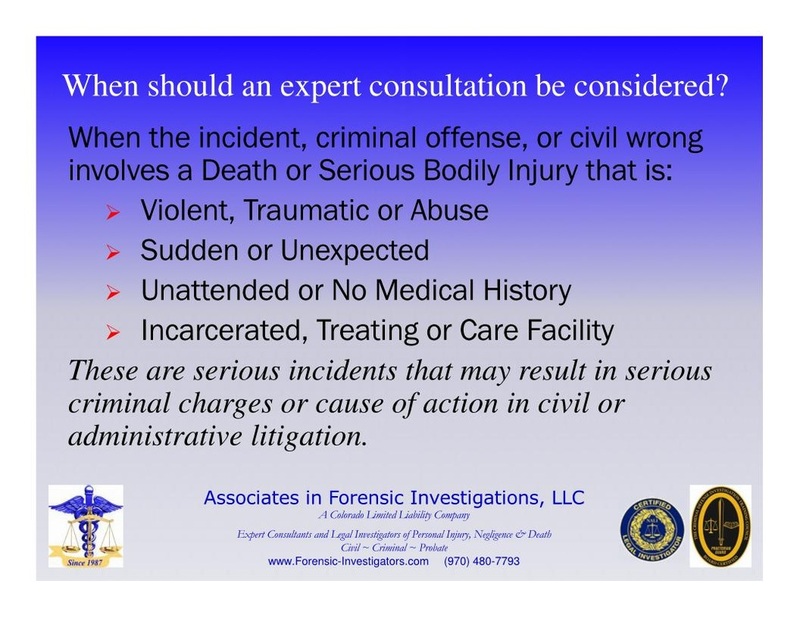 We want to be your first contact when that concern is death investigation and injury causation. First, we want to extend our appreciation for the passion you provide people and families in their most traumatic time of need. As experienced legal and death investigators, we share the passion you provide individuals and families in their most traumatic time of need. Dean is a Certified Legal Investigator (of less than 100 worldwide - www.NALI.com/cli.php), Dean and Karen are both Certified Criminal Defense Investigators (www.CDITCtraining.com) and possess subject matter expertise through education, training, experience and certification in Medicolegal Death Investigation. Dean is a recognized expert in death investigation and injury causation, including pattern injury analysis and investigative protocols. Karen's education, training and experience in social work, as well as both of their experiences in the death investigation system are supportive of our clients' investigative needs. Dean and Karen are both licensed and insured in Colorado - neither are required, but are voluntary programs they have chosen to be part of (www.ColoradoLicensedInvestigators.com). Our agency is a unique and specialized consultation and investigation agency. We are experienced in working with attorneys and families for over 25 years from our own experiences as private investigators and also several years of training and experience with two medical examiner offices, including as scene investigators and forensic autopsy assistants. Consulting with attorneys can be an emotional experience for families, and attorneys are often the first, and sometimes only, outreach a person or family may have when they or a loved one faces serious criminal charges, a traumatic injury or the death of a loved one is unanswered - or leaves them feeling that questions remain unanswered. Your needs as their legal advocate may be as simple as asking for an independent opinion from review of the official investigation to ease their minds, or require a complete investigation when they feel the official investigation was insufficient or not conducted. Our agency is available to respond throughout Colorado, Wyoming, South Dakota and Idaho for all investigations and nationally for expert consultations and to assist investigators as part of your legal team to provide full legal investigative services in civil, criminal and probate concerns. We provide general legal investigations - from scene documentation to witness interviews, and from individual locates to backgrounds and assets & liabilities (we wrote the book on this at www.ProfessionalLocateInvestigations.com). Dean has also written a definitive textbook for legal investigations at www.PracticalMethodsForLegalInvestigations.com. Did you know that you, too, can add Equivocal Death Investigations and Injury Causation Analysis to the list of service you offer to clients? From family concerns to motor vehicle collisions, and assault to death penalty - we have and will be a valuable asset to your team. Accept these cases and refer the the death and injury causation components to our agency, while earning a referral and case management fee and continuing to work the case as you normally would. You remain the lead investigator and field investigator - we help you with the forensic and medicolegal component! Learn more about these cases at http://pursuitmag.com/the-role-of-the-private-investigator-in-equivocal-death-investigations/ and from our Death Investigation for Private Investigators online training at www.MedicolegalDeathInvestigations.com. To help get you started accepting these cases, we have developed a distance learning course - 'Death Investigations for Private Investigators' - at www.MedicolegalDeathInvestigations.com. Every professional investigator understands the reality that time is money. Our specialized services actually rely more on referrals from our fellow professional investigators, and we developed this program to both extend that appreciation and ask for your referrals. Our agency is not competitive, we are complimentary, to our colleagues. Why not benefit from each other? Professional investigators, such as yourself, make up a significant volume of cases referred to us. In fact, you are on this page because you have an interest in both referring a case to our agency and earning some cash for your time in doing so. We appreciate that and your time. We appreciate the referrals our investigative colleagues provide. Our referral program is not complicated and the choice, on a case by case basis, is yours. Use the form below to tell us about you and the case you are referring, or contact us by phone or email, for details.